By any measure, the imposition of tariffs by the United States on U.S. imports of steel, aluminum, motor vehicles and parts, some subset of products imported from China – or all of them is a net loss for the U.S. economy and U.S. workers. 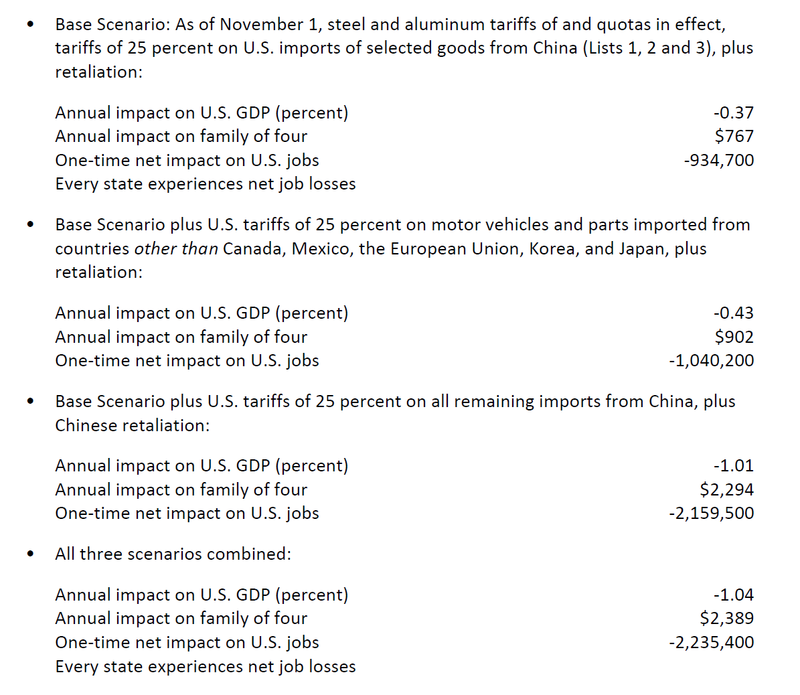 An examination of all the ways in which such tariffs, accompanied by retaliation by U.S. trading partners, affects purchasing and hiring decisions demonstrates that on balance U.S. farmers, manufacturers, services providers and their workers experience greater losses than gains. In some instances, the tariff actions erase all of the anticipated gains from tax reform. MP: It’s really too bad there’s no academic discipline that has studied international trade for hundreds of years going back to the 18th century, with extensive knowledge of trade theories and mountains of research and empirical evidence on protectionism that could have predicted these adverse outcomes from Trump’s trade war.